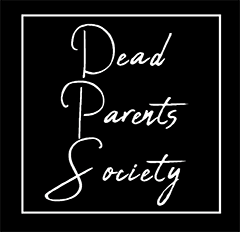 Dead Parents Society is a podcast series about writing about the loss of a parent, hosted by Jamie-Lee Josselyn. We at Dead Parents Society are particularly interested in emerging writers who experienced their loss at a young age and whose writing and world view have been shaped, at least in part, by this experience. In each episode of Dead Parents Society, a small group of us will hear an excerpt from a piece of writing about parental loss, as read by the author, then we'll discuss it for a bit without the writer, then we'll bring the writer in to give us some more insight on the piece and how it came to be. It is our hope that these discussions will be helpful to those of you listening who are writers yourselves, even if you aren't writing about loss, and also to those of you who aren't writers – or aren't yet writers! – who have grieved the death of a parent or someone else close to you. Dead Parents Society is made possible by Penn's Center for Programs in Contemporary Writing's Bassini Writing Apprenticeships and by the Beltran Family Award for Innovative Teaching and Mentoring at the Kelly Writers House. Click here to subscribe to the Dead Parents Society podcast on iTunes.